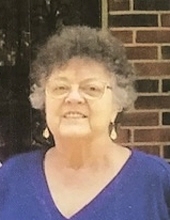 Patricia Ethleice Bowman Mills, 79, passed away on Wednesday, January 30, 2019. She was born in Chickasha, OK on November 27, 1939 to Eugene and Gertrude Ethel Lawrence Bowman. She taught Art with the Oklahoma School System. Patricia was a member of the VFW Legion and the Women’s Auxiliary. She was a member of Beta Sigma Phi and she graduated from Oklahoma State University in 1962. She is survived by her husband, Charles Mills; her children, Mark Darrell (Carolyn) Mills, and Amanda Jo Mills; her sister, Eleanor Jean Becking, MO; and her brother, John Lawrence (Bonnie) Bowman, OK.
She was preceded in death by her son, Jeffrey Charles Mills. Gathering of Family and Friends will be held from 2:00pm until 5:00pm on Saturday, April 27, 2019 at Clark Legacy Center, Versailles Rd. To send flowers or a remembrance gift to the family of Patricia Ethleice Mills, please visit our Tribute Store. Guaranteed delivery before Patricia's gathering of family and friends begins. "Email Address" would like to share the life celebration of Patricia Ethleice Mills. Click on the "link" to go to share a favorite memory or leave a condolence message for the family.